A group of architecture and landscape architecture graduate students who reimagined new ways that Florida’s Broward County could deal with rising water levels and climate change-related flooding have been honoured by Architect magazine for their innovative designs. 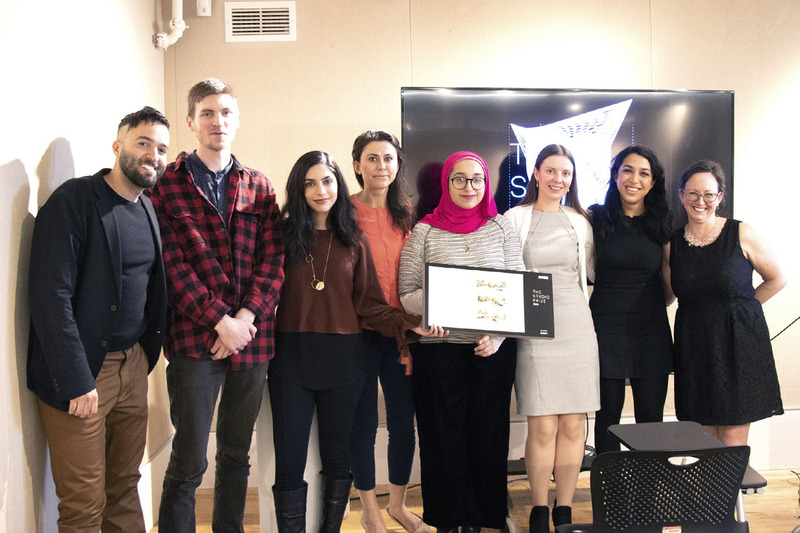 The Coding Flux studio of the John H. Daniels Faculty of Architecture, Landscape, and Design was recognized on March 21 as one of six winners of the 2018 Studio Prize, from more than 100 submissions by architectural schools across North America. The Studio Prize honours thoughtful, innovative and ethical university studio courses. The studio’s prize was one of two awards sponsored by Sloan, which makes commercial restroom products. Sloan Awards recognize investigations of sustainable water conservation and management ideas. “It really puts in perspective that the work that is being done here is at the forefront of innovation,” said Assistant Professor Elise Shelley, who with Assistant Professor Fadi Masoud were the studio instructors involved. While other schools examined a range of issues spanning locations from Switzerland to San Francisco, Masoud’s long-standing research ties with Broward County officials led to an investigation of the flood-prone region by the Coding Flux studio’s 19 graduate students. A recent report underscored the growing threat Florida’s east coast cities face from climate change, with the Atlantic Ocean on one side and the swampy Everglades on the other. The study showed sea water levels in the region are rising six times faster than average. Working closely with county planners, the students developed a geographic information system (GIS) map of the region to understand which areas are most susceptible to rising sea levels, studied the limitations of existing zoning codes, and then designed proposed solutions. Those solutions ranged from flux zoning and hybrid street and canal systems – called “via networks” – to freshwater credits that encourage rainwater harvesting and sustainable development ideas for areas abutting the Everglades. “One of the benefits of working with a forward-thinking county like Broward that doesn’t have many resources is that the studio helps them think about innovative ideas that they otherwise wouldn’t have the time or capacity to,” said Masoud. Niloufar Makaremi, a Master of Landscape Architecture graduate, said the via network proposal she worked on with fellow student Marianne Lafontaine-Chicha would help create new green spaces and provide additional evacuation routes in Fort Lauderdale. The network ties roads to alternative transportation routes such as canals, and creates a sidewalk system that floats as water rises. “No matter what the water levels are, having these pathways with lighted signs could help guide people to the location of the nearest evacuation shelters and health services,” said Makaremi. Zainab Al-Rawi and Tania Hlavenka worked on a project to create parking lots in Fort Lauderdale that would double as “green connectors,” adding recreational space, tree cover and rain gardens to encourage low impact developments. “We were thinking about solutions as parking lots become obsolete with the introduction of autonomous vehicles,” said Al-Rawi, a Master of Architecture graduate who works as a research assistant at U of T.
“It really influenced how I think now when I work on projects,” added Hlavenka, a Master in Landscape Architecture graduate currently working as a graphics technician. Rayna Syed and Alexandra Lazaervski tackled the issue of coastal erosion, as storms wash away sand from beaches. “Coastal erosion is a problem all over the world and climate change is an issue that always has to be in the back of your head now,” said Syed, a Master of Landscape Architect graduate who is currently working in the private sector. Master of Architecture student Aidan Loweth worked on an Everglades proposal that would take advantage of elevated levees by adding narrow buildings to create new linear cities safely above flood waters. “Basically, it’s like creating an entire city that can fit on two streets,” said Loweth, who will graduate in April. One of the unique features of the Studio Prize and Sloan Award is they are judged “blind,” without identifying the university behind each submission until the winners are chosen. This is the second year that U of T has captured the honours. In 2017, the Ravine Recreate studio also won a Studio Prize-Sloan Award. Masoud said the environment at the faculty helps to enrich the student experience.